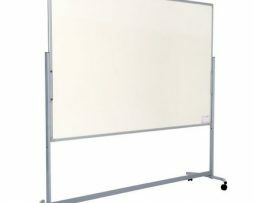 Display your company’s lean metrics and messages with our great range of noticeboards and custom displays for your facility. 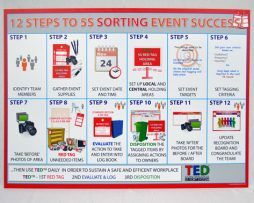 Use this powerful wall guide to educate and remind those in your facility of the 12 steps to running a successful 5S Red Tag Sorting Event. Printed in High Definition and made from durable, high quality 3mm thick foamex, this guide can be used in the harshest of environments such as Warehouses and Shop floors, as well as exterior locations such as construction sites. 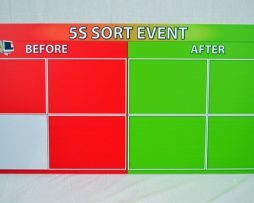 The 5S Before and After Board is intended for use with both the 5S Sorting Event Wizard Event Boards and the TED 5S Continuous Sort System. 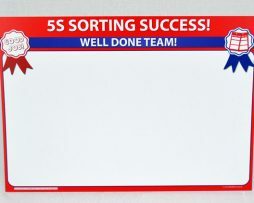 The 5S Sorting Event Recognition Board is intended for use with both the 5S Sorting Event Wizard Event Boards and the TED 5S Continuous Sort System. 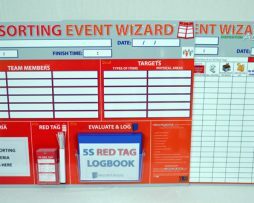 The award winning 5S Sorting Event Wizard Boards are available in this kit. Magnetic Coloured Frames for Documents are a unique range of colour coded frames designed for easy and prominent document display. Perfect for use in offices, shops, libraries and throughout the workplace to display all types of literature, certificates and information. The design allows for easy insertion and removal of documents without the necessity of moving the frame. If you want to choose different size, please CLEAR SELECTION. This high quality, Mobile Magnetic Display is used throughout 5S Superstore’s product range to maximise the effectiveness of their kits, training products and interactive team based quality improvement tools. Simply create and print off your A4 / A5 sized paper sign and place underneath floor cover. 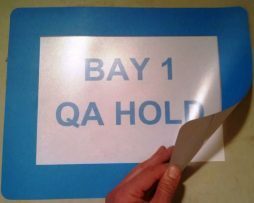 These signs can be used for warehouses, factories, shops and much more! Self-Adhesive Coloured Frames for Documents are a unique range of colour coded frames designed for easy and prominent document display. Perfect for use in offices, shops, libraries and throughout the workplace to display all types of literature, certificates and information. The design allows for easy insertion and removal of documents without the necessity of moving the frame.